The World Boxing Council was the first boxing organization to introduce life and medical insurance for boxing. 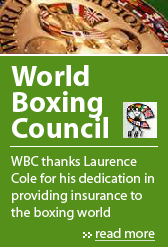 For 11 years Laurence Cole Insurance Agency has provided our life and medical coverage for all WBC World Title Fights as well as Affiliate Championships all over the world. The quality of their service has been outstanding, and without doubt we will recommend this company to anyone looking for an efficient and easy to work with insurance provider. Cole Insurance Agency understands the demands of a PROMOTER. Our goal is to make doing business with us easy and efficient. As a standard operation procedure, we provide the Certificate of Insurance to the State Boxing Commission. We are also knowledgeable of the combative sports industry. We support the Associations of Boxing Commissioners. We are members of the North American Boxing Federation, the World Boxing Council, the World Boxing Association and the World Boxing Organization. We offer comprehensive spectator liability programs for various types of events (sporting events, concerts, festivals, etc) to event planners, facilities and private individuals. Copyright© 2010 Laurence Cole Insurance Agency. All rights Reserved.